Looks exactly as Phil has described below. I assume Phil is referring to "Nottlers House" at grid reference TL135017. I have not seen this building, it is not mentioned in the current Hertfordshire Pevsner (1977) nor can I find any listing for this building. Unfortunately there is a problem at the moment (July 2016) accessing the Herts Historic Environment Archive following a reorganisation of the Herts CC website recently! I'll try and look it up when I can. This building would appear to have been subject to wanton neglect of the grounds and galloping development over the 90 years since the picture was taken such that it is almost unrecognisable. The tree shadows and disposition of the 1926 picture almost accords with the current day Google Maps picture and at the same time of year looking at the leaf cover. Though the Google picture is probably a little earlier in the day. The house is oriented almost west –east with the gardens South facing. 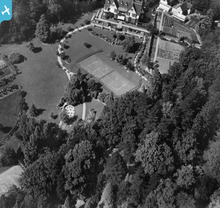 The formal / vegetable gardens to the east of the house are gone as is the tennis court and very little of the terrace survives. The 1926 house forms the centre south facing part of a property and that older section is covering a footprint of under a third of the current conglomerate building. This Google maps reference will land you on the old tennis court 51.701505, -0.358822 Copy and paste the ref. Consider now the roof line above the front door and you will observe two small dormer windows and these are also still visible on the Google imagery as are the larger Gable ends to the west and east of the two dormers. a connecting new structure with a 4 pitch roof running North-South. This latter structure is built on part of the old terrace and a new terrace section has been constructed on the western side of it. Starting again at the footpath and moving to the east of the building we find the old house roof line has been extended beyond the eastern large gable (south facing) and two more small dormers have been added. There then appears to be a more modern addition at this end of the house projecting out of the front of the house in a southward direction towards the garden and with a flat roof terrace. Various differing additions have then been added again to the West encroaching into the formal vegetable gardens. Much better is the view on Bing maps which gives you a birds eye elevation which you can rotate to the four compass points. Locate the same house on the map view and select Aerial and then Birds eye and zoom in. There is no easy link to Bing maps but if you have Google earth then maybe you can get that birds eye view, full frontal. Aerodrome. Access road off Station Road. I'm fairly sure this is the Holbeck Hall Hotel which famously disappeared over the cliff in about 1996. Actually I think I'm wrong - it doesn't quite look right although it's the right period. This is currently the Scarborough Campus building of Hull University, on the A165/Filey Road. It formerly belonged to Leeds Uni and before that was known as North Riding College. I trained as a teacher there in the early 1990s. Has seen some significant development since this image! But still clearly recognisable. Thanks for taking a look at this image. 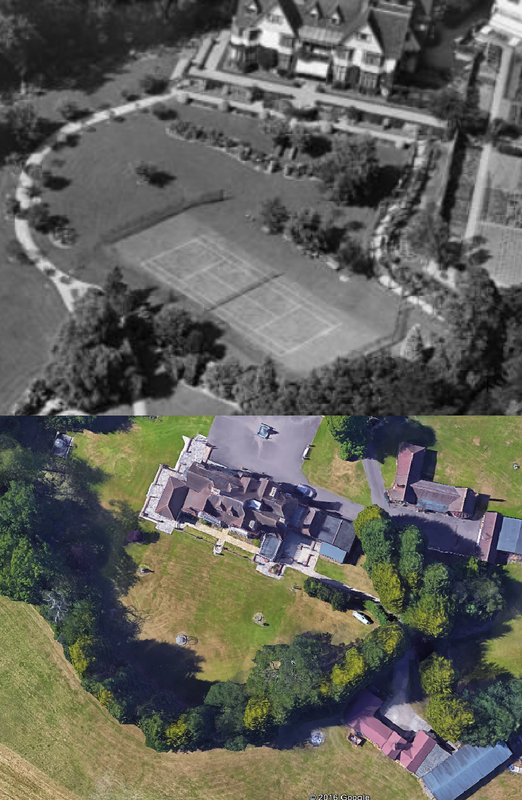 I can't make the buildings at the top of the Aerofilms image match the college I'm afraid, either on the contemporary Ordnance Survey mapping or comparing the current frontage with this photo. According to the Aerofilms Ltd Register, this photo was taken at a similar time to EPW016004-11 and EPW016014. Interesting Arts & Crafts house with a bold corner arrangement; an offset projection of windows. This is almost certainly an Arts & Crafts-era building indicated by the layout of the windows and gables along with the interesting corner arrangement to the left. 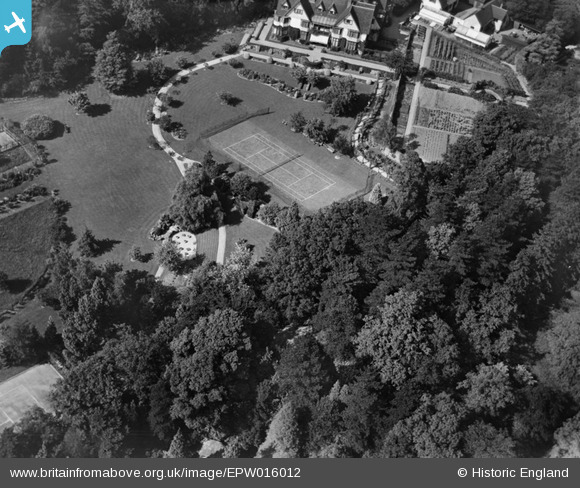 The layout of the building & grounds is very similar to Cober Hill Hotel, near Scarborough. Possibly the fashion? Thank you for your suggestion and contributions, they're very much appreciated! We've looked at Cober Hill on our historical mapping but, although they are similar, it doesn't match up to the photograph. We welcome any more suggestions as to where this photograph might be...it's a tricky one!